Ice cream at your wedding…? 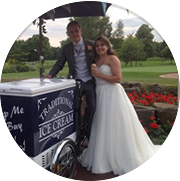 Our traditional victorian ice cream tricycles provide a fantastic alternative for your special occasion. They can be inside or outside your venue and serve luxury hand scooped ice cream and sorbets, offering up to 36 quality flavours and catering for all dietary needs.